In her brilliantly inventive and haunting debut collection of stories, Julia Armfield explores bodies and the bodily, mapping the skin and bones of her characters through their experiences of isolation, obsession, love and revenge. Teenagers develop ungodly appetites, a city becomes insomniac overnight, and bodies are diligently picked apart to make up better ones. The mundane worlds of schools and sleepy sea-side towns are invaded and transformed, creating a landscape which is constantly shifting to hold on to its inhabitants. Blurring the mythic and the gothic with the everyday, salt slow considers characters in motion - turning away, turning back or simply turning into something new entirely. 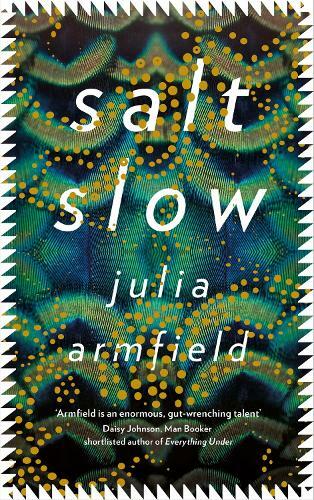 Winner of The White Review Short Story Prize 2018, Armfield is a writer of sharp, lyrical prose and tilting dark humour - salt slow marks the arrival of an ambitious and singular new voice.